The Starting Point, watercolors, SG, 2011. So, at long last, they were ready to go. The wagon, this time, was not one of Molly’s, it was a gift from the Elves. It had turned out that the whole nation of Elvenland was so interested in their Journey to Mount Tsarang, and in their Quest for the Watcher, that the Council of Elders of the Elvenland norns had offered to equip a wagon with the latest communication technology, so that the Journey could be transmitted directly, every day, on all channels of the Elven Innernet. Understandably, all were concerned about the future of their world, and interested in the outcome of the group´s enterprise. So the wagon was loaded and stocked, wheels greased, every nook and cranny minutely revised by an army of busy Elves. Horses were chosen for the wagon, sturdy beasts used to pulling weights along, and three beautiful creatures, friends of the Elves and of the human species, to carry Corwin, Tenwar and Ninraen. It was decided that Master Blaise, due to his old age, would ride with Vivian in the wagon, though, of course, he protested loudly. The Journey Temple at Norn Gundasä was made of wood, not of marble, and it had a very different feeling about it than the Journey Temple at the Guild Halls. It was located smack in the center of the Elven norn, with sliding walls made of golden wood open to the beautiful seaside gardens. The sea winds would blow right through it,and make it cool and inviting on sunny days, the grounds being a picnic place for families. At the very centre of the floor a magnificent Mandala made of all the precious woods of the land featured the Starting Point. The Ceremony took place at dawn, the birds wildly welcoming the day. At that moment, the Journey Temple was surrounded by all the familiar noises of the village waking up. It was the right time to set forth on an adventurous journey. 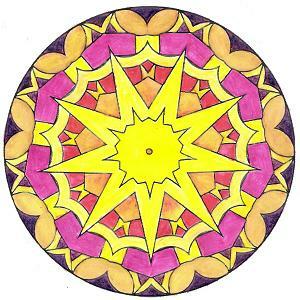 They stood in a circle around the Mandala, the five of them, gravely looking at each other. Vivian could feel the warm current going through her hand as she held Corwin´s on her right, and Ninraen´s on her left. Master Blaise came next, looking tall and dressed as a Druid should be, in clothing according to his rank as Chosen-Chief of his own Mystery School. On his left he was holding Tenwar´s hand; Tenwar was holding Corwin´s right hand. The circle felt strong, vibratingly warm, and complete. The whole village was assembled outside the Temple, silent, intensely present. Everyone knew the importance of their mission, and was accompanying them, supporting them, in their thought. May this Journey be blessed. May this Land be blessed. They opened their eyes and smiled at each other. Finally they were ready to start on a new adventure that, surely, would change their lives forever.